Daines was attending his daughter's wedding but was willing to come back to the Capitol if his vote was needed. When Manchin cast his vote, a protester in the Senate gallery shouted "shame, shame shame." 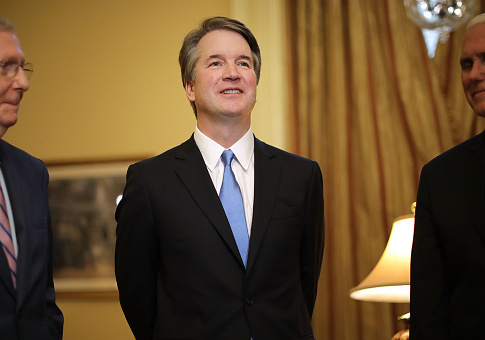 Kavanaugh is Trump's second Supreme Court pick to be confirmed and his 69th successful appointment to the federal bench. The vote comes after a long and bitter confirmation process, in which Kavanaugh was accused of multiple instances of sexual misconduct and assault when he was in high school and college. The first accuser, Christine Blasey Ford, told the Washington Post that Kavanaugh, then a junior in high school, attacked her when they were at a party in Maryland in the early 1980s. A second allegation came from a woman named Deborah Ramirez, who accused Kavanaugh of exposing himself at a dorm party during his freshman year at Yale. Another allegation was brought forth from a woman named Julie Swetnick, who is represented by anti-Trump lawyer Michael Avenatti. Swetnick claimed Kavanaugh was involved in a series of "gang rapes" when he was in high school, but she offered no additional evidence or witnesses to support her allegations. Some Democrats have hinted at impeaching Kavanaugh if they retake control of Congress, the Washington Post reported. "Much of Washington has spent the week focusing on whether Judge Brett Kavanaugh should be confirmed to the Supreme Court," Lisa Graves wrote in a Slate column on Sept. 7, more than a week before the New Yorker published the then-anonymous sexual assault claims of Christine Blasey Ford. "After the revelations of his confirmation hearings, the better question is whether he should be impeached from the federal judiciary. I do not raise that question lightly, but I am certain it must be raised." Senate Majority Leader Mitch McConnell (R., Ky.) said the Democrats' behavior and actions towards Kavanaugh have energized the Republican base ahead of the midterms. "It’s been a great political gift for us," McConnell said. "The tactics have energized our base."